School of Electronics and Nanoscale Engineering, University of Glasgow, Glasgow, UK. The ever-growing demand for food with increasing population demands for intervention through new technological solution to increase food production in limited resources. This paper presents a review of various sensing technologies for intervention and presents the comparison of the accuracy and sensitivity of terahertz (THz) sensing technique with other methods which is found to be more effective, feasible and productive. The realization of water as an important and fundamental component to the timely growth of plant leaves, in this paper some preliminary results of applying terahertz sensing technology to the plant science to estimate the water content at the cellular level in various leaves has been presented. Hence, shows the potential of using THz sensing as a promising candidate for future agriculture technology. With the rising scarcity of water resources in the plant science sector, many significant and modern techniques have been evolved in applied plant biology at various level over the past decades. In most countries, agriculture is considered as the spine in the overall development of countries especially in developing countries due to its significant role in enhancing economic development of country . To meet with the challenging growth of population, it is important to have smart, sustainable, and precision agriculture to increase the productions of crops as well as providing concrete information of tailoring soils and crops by employing various sensors into the agricultural field. Precision agriculture includes the usage of fertilizers, pesticides, and herbicides to minimum degree for maximum production. The sensors that have been functional so far in terms of achieving the accuracy in agriculture are temperature sensors, humidity sensors, soil moisture sensors, ph sensors, light sensors, and colour sensors, and bio sensors (used for detection of nutrients contents in soil) [2,3]. Various systems have been proposed, where sensors have been utilised at large scale as shown in Figure 1 and have produced the optimum results by mitigating the overall workload of farmers in cultivation and addresses drawbacks of conventional farming. There have been occasions where the multiple sensors were brought into service to determine every parameter that affected the overall growth of crops, and web-based tailored applications and offered flexibility to monitor the agricultural land from any location. All of the available technologies do the detection once damage is done but there is need to develop more innovative and novel approaches which can detect anomalies proactively before damage has been done due to the rapid growth in the population, lack of crops productivity in existing technologies, unnecessary and untimely use of fertilizers and pesticides inviting health and purification expenses incurring nutrients and toxins increments [4,5]. Figure 1: Various sensing technologies applied at different stages for the detection of the contaminated crops. Considering the conventional approach, standard sensors, as mentioned earlier, have been employed to meet the huge requirement of crops productivity, appropriate usage of fertilizers, capable of detecting small amounts of impurities in soil and pathogens in plants, nutrients deficiencies in plants. Regrettably, they have not obtained prolific results in agriculture sectors and clearly appears to be unfeasible and unachievable. During the past several decades development in science and technology especially in agriculture field could not offer longer lasting and reliable solutions to sustain the farm productivity . In spite of employing conventional approach such as macro sensors, could not have brought required productivity outcome especially in developing countries. In addition, it was also far difficult to reduce the environmental and other resource expenses related to agricultural production, lessen the nutrient loses in fertilization and amount of spread chemicals [7,8]. Since the evolution of nano-technology, an opportunity to dig more deeply into molecular level has been made possible, such as in cell, leaf, and plants and has an ability to detect the disease at very early stage employing nano-sensors made up of nanomaterials. This nanotechnology can play a vital role in the overall productivity by controlling the nutrients, observing the water quality and any presence of pesticides for the effective and sustainable progress in agricultural field . Comparing to micro approach, this technology is deemed to have more reliability, fast response, demonstrates low-cost system for overall monitoring and maintaining the health of the leaves . For instance, new nanowire-based materials used in nanotechnology contains exceptional detecting and sensing properties and it can deliver advanced sensitivity, better selectivity, and probably provides better stability at lower cost. In this regard, nanosensors applications operating at terahertz frequencies introduces distinctive opportunities for sensing plants’ responses to changes in environmental conditions, contamination detections, pathogen attacks and other stresses. It also has the capability to monitor the plants signaling and responses during process of growth and development, water content level in plants’ leaves, bacteria detection in crops at the molecular level [10-12]. The evolving applications of Terahertz (THz) technology has fascinated numerous horticulturists, researchers and scientists like plant physiologists or biochemists in various field of applied plant biology . The prevailing challenges of food security, sustainability and the effect of climate change have immensely engaged the researchers in exploring the field of Terahertz in-depth considering it as new source of vital improvements for the agricultural sector . In recent times, there has been significant advancements of THz applications in numerous fields such as biomedical imaging, diagnostic applications, safety and security due to its distinctive characteristics. Some of the advancements that have been achieved from these unique features are security imaging of invisible items, atmospheric studies, processing the quality control of food, high- frequency communication and non-contact imaging for protection of paintings and manuscripts, and medical imaging for non-invasive diagnostics of dental care and skin cancer [15-19]. Despite these aforementioned advantages and enormous contributions of Terahertz (THz) technology various field, researchers are of view that its potential disseminate reasonably in the field of plant science is still considered one of the least examined research areas until now . Nevertheless, researchers have been made efforts such as monitoring and controlling of environmental systems, crops productivity enhancement, protection of crops from any pathogen attacks, and particularly, monitoring and determining the appropriate amount of water content in plants leaves by employing various methods . In the past, many functional techniques have been suggested such as infrared imaging, hyperspectral thermal imaging and magnetic spectrum imaging to determine the comprehensive analysis of spatial and spectral information of the water content in plant leaves. Although there has been substantial progress achieved by utilizing these techniques, however, there are some limitations related to each technique and can be enhanced further. In addition, thermal and hyperspectral imaging are generally categorized as derivation methods, that mirror the in-depth influence triggered by modification of water content [21-26]. For instance, considering the infrared or microwave spectrum, they are either incapable of detecting minor changes in water status in leaves or are littered with the inorganic salt content of the plant, resulting in vital disturbances in overall measurement process (Figures 2 and 3). 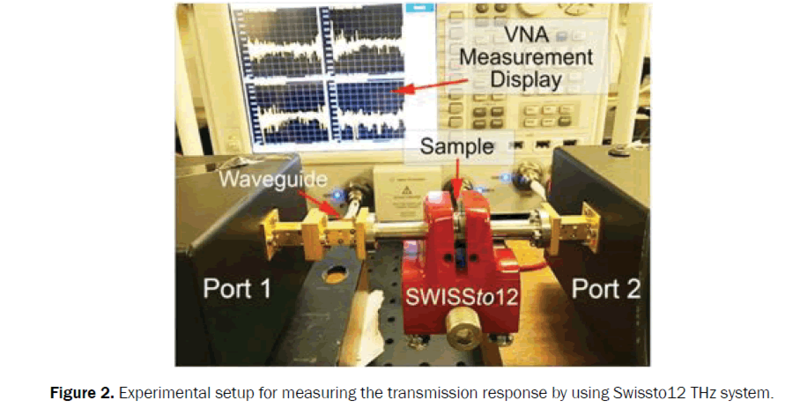 Figure 2: Experimental setup for measuring the transmission response by using Swissto12 THz system. Figure 3: Samples of different fresh leaves used for the purpose measurement process. In addition, the resolution of the imaging measurements in microwave spectrum is limited due to the relatively hefty wavelength that this method employs the imaging resolution of microwave radiation is restricted to nominal wavelength of nearly 2.5 mm. Comparing the image resolution of microwave with MRI, it displays the more advance resolution but has a drawback of limited accessibility and a high-cost. In comparison to other methods, Terahertz (THz) technology have shown unique, distinctive and novel advances in exploring the molecular changes of the water in the leaf due to its high sensitivity and penetration feature of THz radiation to the absorption of water by the leaves . Further emphasizing, it is due to THz that the uneven variation of water content in leaves, distribution and mobility of water in plant tissues have been influenced by several factors, such as diseases, environmental stress, and growth rhythm. A leaf which basically consists of a complicated biological tissue structured in spatial layers and distinctive molecules such as carbohydrates, proteins and several other molecular substance compounds . However, at this stage, it is not essential to describe the structure and configuration of plant leaves in detail. Infact, it is more significant to solely consider those components that truly move with the electromagnetic radiation. Therefore, it has been identified that the main substances considered to be water, air and solid plant material [27-29]. At present, much of the current literature on THz emphasis mainly on channel characterization and modeling of body-centered communication and shows patterns of pathway loss on the body for various body circumstances. Though, these models lack the characteristics to predict any loss of direct transmission in the centre containing plant leaves. To overcome these equivalent shortcomings, authors in have suggested a numerical method of primary THz path-loss models that can foresee the absorption and scattering reaction of plant leaves for estimating the total signal loss . Despite the fact that these models rely on simulated results, as described in the literature on for distinct leaves, can be accepted by assessing them with realistic measurements of leaves. In this paper, employing the state-of-the-art Terahertz (THz) technique, the focus is primarily to introduce a preliminary analysis and to investigate the water content and presence of any pesticides in leaves in the range of 0.75 to 1.2 THz frequency using the Swissto 12 system. It is also aimed to determine the pathloss response of various leaves, and the complex permittivity of leaves of fresh and drought stress leaves. Consequently, this has led to the valuable information and strong correlation is identified considering the feasibility of this novel method for examining the temporal and dehydration response in plants’ leaves towards various environmental conditions [31,32]. Prior to start the THz transmission measurements using the Swissto 12 system, full calibration of on two ports (wR1.0), also known as (Short-Open-Load-Through) was performed using the modern calibration technique as shown Figure 1. The purpose of whole calibration was to avoid any measurement errors produced by system or any other external factor. As mentioned previously, Swissto 12 system has a frequency range from 0.75 to 1.2 THz, with a thickness range from 40 m to 4 mm. In addition, both reflection coefficients (S11 and S22) and transmission parameters (S12 and S21) were measured whilst performing the experiments on various leaves  (Figures 4 and 5). Figure 4: Demonstration of measuring the thickness of leaf using Vernier calliper. Figure 5: Using Swissto12 THz system, transmission response was obtained for six leaves. Six various fresh leaves were used in the experiment named as; basil, cauliflower, lettuce, cabbage, iceberg, sage. In order to obtain the accuracy and precision, measurements were executed three times at different orientation on all the leaves. This is also because that leaves may have different water content levels at different positions. The tested environment temperature for the measurements was 23°C ± 0.1°C, and the humidity was found approximately between 50% ± 20% (Figure 6). Figure 6: Path loss response of some leaves considering the effect of different thickness of leaves, and changes in water content of leaves. For the examination of the measurement results of leaves, it was significant to calculate the thicknesses of twelve leaves by means of high precision measurement tool called Vernier calliper as shown below in Figure 4. Each of those leaves were tested individually for thickness under the same environment conditions. The thickness range of leaves were found in the threshold range of the system (40 μm to 4 mm) enabled to perform experiments on them. This process was repeated three times to obtain the thickness of leaves at different positions. 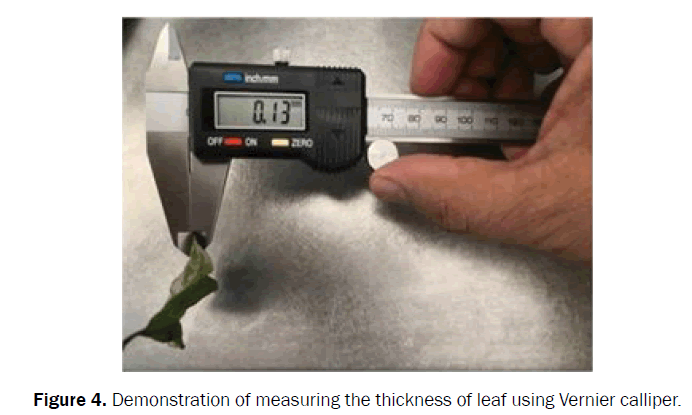 During the investigation of thickness of leaves, it was observed that thickness of leaf continuously increased with the growing water content in leaves. In order to determine the transmission and path-loss response of leaves, the leaves were placed in material characterization kit (MCK) Swissto 12. It was noticed that transmission response of leaves were evidently distinguished from each other as shown in Figure 5. Based on the initial measurement results, it was noticed that different leaves exhibited various attenuation and, clearly showed correlation to the amount of water content or any pesticides presence in leaves. It also occurred that variation in transmission response could be due to different thickness of leaves, and components of plant physiology. In addition, from Figure 5, taking all the measurement response into consideration, it can be concluded that out of six leaves, cabbage exhibits the higher amount of water content followed by pea shoot and others. These observations lead to significant and meaningful information to study and analyse the existence of any pesticides in leaves with THz frequencies. Moreover, results also reveal that cauliflower exhibits a less amount of water content or presence of any pesticides in leaves as compared to other leaves. However, it also shows a sensitive region in the frequency range from 0.75 Hz to 0.8 Hz. Furthermore, path-loss response was also obtained as shown in Figure 6, proven to be more intrigued results considering the response of various leaves. It was depicted that in certain frequency range between 0.79 Hz to 0.83 Hz as shown in Figure 5, revealing a more sensitive frequency zone and precise identification of changes in water content of leaves. It was perceived that the Path-loss response could be due to the distinguished surface roughness of leaves, presence of water content in leaves, and propagation properties of leaves in the process of their growth. 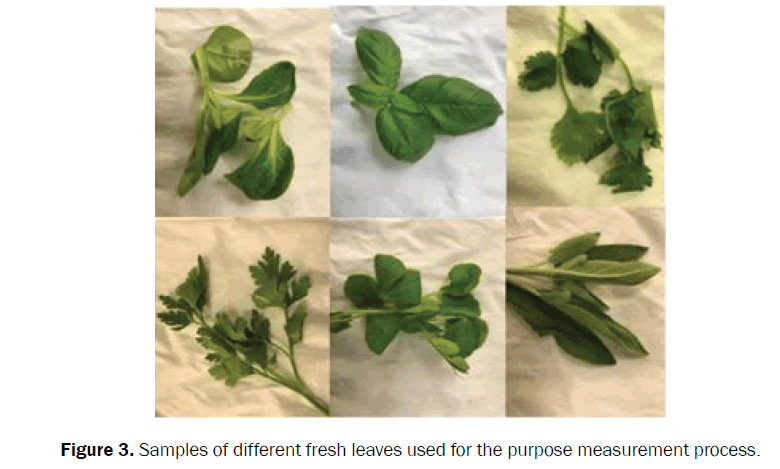 Comparing the results of three leaves in Figure 6, it is interesting to notice that the aromatic coriander’s leaves exhibit a high path-loss response compare to lettuce and iceberg leaves. From th it can also be noticed that the least path-loss response obtained by lettuce marginally less than iceberg due to having some high dip in the frequency range from 1 Hz to 1.1 Hz. Eventually, it reveals that there is relatively high dehydration rate or less water content in aromatic’s leaf compare to other results. In addition, results also clearly revealed the relationship between the thickness and water contents in leaves. This paper describes various technologies that have been currently used to enhance the agricultural production to meet the demand of growing population. Due to the growing population and considering the current agricultural situation, it has been analysed that these previously conventional technologies appears to be unfeasible and unable to produce the optimum results in terms of crops productivity, timely use of fertilizers, and detection of bacteria at an early stage to mitigate the overall cost. Therefore, in order to obtain the more accuracy and an effective use of water in agriculture sector, terahertz sensing has the potential and is deemed to have more fast, reliable response for the overall monitoring and maintaining the health of the leaves. This paper emphasizes on the advancement and development of terahertz technology applications in agriculture sector and presents some of the preliminary studies done in this domain, which has huge potential to do interventions proactively and change the paradigm of agri-tech. Adnan Zahid is funded by EPSRC doctoral training programme. Beyrouthya MEI. Nanotechnologies: Novel solutions for sustainable agriculture. Adv Crop Sci Technol. 2014;2:8863. Mukhopadhyay SS. Nanotechnology in agriculture: Prospects and constraints. Nanotechnol Sci Appl. 2014;2:63-71. Ravichandran R. Nanotechnology applications in food and food processing: Innovative green approaches, opportunities and uncertainties for global market. Int J Green Nanotechnol Phys Chem. 2010;1:72-96. Prasad A, et al. Nanotechnology in sustainable agriculture: Recent developments, challenges, and perspectives. Front Microbiol. 2017;8:1-13. Dhewa T. Nanotechnology applications in agriculture: An update. Octa J Environ Res. 2015;3:204-211. Omanovic ME and Maksimovic M. Nanosensors applications in agriculture and food industry, Bull Chem Technol. Bosnia Herzegovina. 2016;47:59-70. Stetter JR, et al. Sensors: Engineering structures and materials from micro to nano. Elecrochemical Soc Interface. 2006;66. Gruère GP. Implications of nanotechnology growth in food and agriculture in OECD countries. Food Policy. 2012;37:191-198. Ram P, et al. Nanotechnology in sustainable agriculture: Present concerns and future aspects. African J Biotechnol. 2014;13:705-713. Afsharinejad A, et al. Performance analysis of plant monitoring nanosensor networks at THz frequencies. IEEE Internet Things. 2016;3:59-69. Chen H and Yada R. Nanotechnologies in agriculture: New tools for sustainable development. Trends Food Sci Technol. 2011;22:585-594. Lu J and Bowles M. How will nanotechnology affect agricultural supply chains?. Int Food Agribus Manager Rev. 2013;16:21-42. Afsharinejad A, et al. Variability of terahertz transmission measured in live plant leaves. IEEE Geosci Remote Sens Lett. 2017;14:636-638. Joyner JJ and DKV. Nanosensors and their applications in food analysis: A review. Int J Sci Technology. 2015;3:80-90. Hafez HA, et al. Intense terahertz radiation and their applications. J Opt. 2016;9. Kürner T and Priebe S. Towards THz communications status in research, standardization and regulation. J Infrared Millimetre Terahertz Waves. 2014;35:53-62. Breitenstein B, et al. Introducing terahertz technology into plant biology: A novel method to monitor changes in leaf water status. J Appl Bot Food Qual. 2011;84:158-161. Zahid, K, et al. Terahertz characterisation of living plant leaves for quality of life assessment applications. URSI, Poznan. 2018;117-120. Born N, et al. Monitoring plant drought stress response using Terahertz time-domain spectroscopy. Plant Physiol. 2014;4:1571-1577. Jornet JM and Akyildiz IF. Channel modeling and capacity analysis for electromagnetic wireless nanonetworks in the terahertz band. IEEE Trans Wireless Communication. 2011;10:3211-3221. Sarracanie M, et al. Low-cost high performance MRI. Sci Rep. 2015;5:1-9. Ulaby FT and Jedlicka RP. Microwave dielectric properties of plant materials. ITm jAe’I. 1984;4:406-415. Achata E, et al. A study on the application of near infrared hyperspectral chemical imaging for monitoring moisture content and water activity in low moisture systems. Molecules. 2015;20:2611-2621. Song Z, et al. Temporal and spatial variability of water status in plant leaves by Terahertz imaging. IEEE Trans Terahertz Sci Technol. 2018;8:520-527. Jordens C, et al. Evaluation of leaf water status by means of permittivity at terahertz frequencies. J Biol Phys. 2009;35:255-264. Wolf SF and Migeon BR. Studies of X chromosome DNA methylation in normal human cells. Nature. 1982;295:667-671. Torres V, et al. Monitoring water status of grapevine by means of THz waves. J Infrared Millimetre Terahertz Waves. 2016;37:507-513. Afsharinejad A, et al. Transmission through single and multiple layers of plant leaves at THz frequencies. In Globecom 2017-2017 IEEE Global Communications Conference. 2017;pp:1-6. Gente R, et al. Determination of leaf water content from terahertz time-domain spectroscopic data. J Infrared Millimeter and Terahertz Waves. 2013;34:316-323. Afsharinejad A, et al. A path-loss model incorporating shadowing for THz band propagation in vegetation. In IEEE 2015 Global Communications Conference (Globecom 2015). 2015;pp:1-6. Swissto12.Printing the future of radio frequency. Switzerland. 2018. Lin Y, et al. A dual substrate-accessing mechanism of a major facilitator superfamily protein facilitates lysophospholipid flipping across the cell membrane. J Biol Chem. 2018;118.